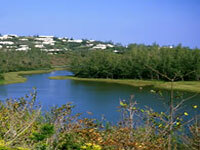 Bermuda's largest and most accessible nature reserve offers excellent trails and the island's finest bird watching. The reserve attracts scores of migratory shorebirds and waterfowl, with the greatest variety to be found during spring and autumn. Of the two dozen shorebird species that feed at the edge of the brackish Spittal Pond, the Lesser Yellowlegs are the most abundant. Egrets and Herons are frequent visitors as well. Visitors can also walk along a scenic mile-long nature trail that runs through the reserve along the shoreline and through woods and farmland.